If you're like most of us you're probably planning to have a family reunion in June or July and have only weeks to find and organize fun and meaningful family reunion activities. The best way to start is deciding upon a reunion theme. Themes are not only a source of inspiration, they serve as a guide and basis for the events activities. 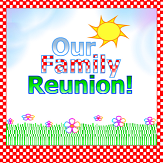 Looking for fun and meaningful family reunion themes? Don't despair. Looks like someone has done all the work for you. Well almost. While there is a reunion theme page that lists five popular themes families have been using for years, you'll still have to decide which theme you'll actually use. That may not as easy at it sounds. Each theme is a keeper. Preview the Five Family Reunion Themes along with associated logo, fliers, invitations, poems and t-shirt ensemble. I personally love the glowing tree logo for the "Traditional Family Reunion. Even better, each theme has it's own invitations, fliers, certificate and poems. Let's say you decide on a theme among from theme list and you want to take your reunion planning to the next level. If you're an apps person who likes to work with online or stand-alone software just download the Family Reunion Planner software. If you're a keepsake kind of person who likes to work from a hardbound or paperback book complete with worksheets get Fimark's Family Reunion Planner Guide Workbook and Keepsake. I love this book. Just after the event details page it open with an excerpt from the poem "Finding Our Way Back Home". As you advance through the pages planning the event excerpts of the poem seem to follows you anticipating the very experiences you'll likely have bringing the event to fruition. There are keepsake journal entry pages and a family recipe compilation section. The Themes section covers all the steps necessary to plan a meaningful family reunion event and details suggested activities and banquet dinner programs. In addition to this there are genealogy research worksheets and forms for family history presentations.Looks like you'll have your family reunion event planned and organized in no time at all.